The Blue Willow Design was inspired by Chinese porcelain that had paintings and patterns in cobalt blue under the glaze. These dishes were known as blue and white porcelain, and were manufactured in China and exported to other countries. Cobalt blue pigments came from the mining industry in the Middle East. China imported the pigments as a raw material and used it in their porcelain production. At that time, China was considered the master of producing porcelain and it was one of their main exports. In fact, that is why porcelain dishes are called China today. Some of the blue and white porcelain featured Islamic designs, but a lot of the blue and white porcelain designs were adorned with paintings of what was thought to be Chinese landscapes, but has since been called more of a fantasy created by imagination. 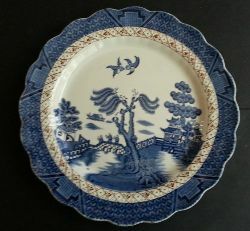 The Blue Willow dishes became popular in America and Europe. These Chinese creations inspired the development of the Blue Willow design. The Chinese blue and white porcelain was most often hand-painted, while the British version is considered transferware, where the pattern is applied under-glaze by transfer or stamp. 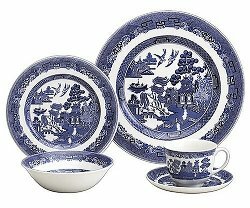 The originator of the Blue Willow pattern is unknown. However, first development of the pattern is presented to be from the Staffordshire area of England. Three people have been credited with the origination of the pattern. They are Thomas Minton, Thomas Turner and Josiah Spode. Thomas Turner is believed to be the originator of the pattern, as he specialized in creating blue under-glaze patterns with Chinese designs, although Thomas Minton is believed to be the one that did the engraving of the willow pattern on the original copper plate that was used to transfer the pattern to porcelain. Minton was apprentice to Turner and later to Josiah Spode, who was responsible for mass distribution that led to popularity of the pattern. 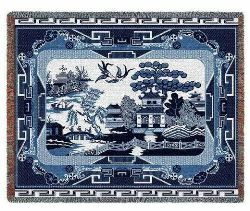 The Willow pattern was first introduced in 1780 and went into mass production in 1784. The pattern was picked up by several manufacturers, who tweaked the pattern a bit to make it different. Today, the pattern is still produced by several manufacturers and it is still widespread. Blue Willow dishes are highly collectible.